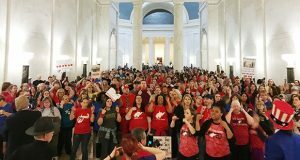 The longest statewide teacher strike is going to drag into another day Thursday, at least for some of those who have been out of work now since last Thursday. The teacher strike enters its third day today as educators remain dissatisfied with the pay hike proposal by Gov. Doug Ducey and many schools remain closed despite threats by the Goldwater Institute to sue.